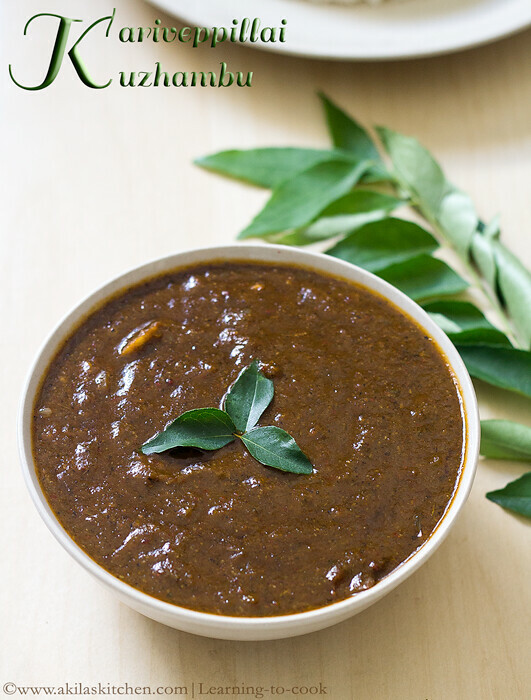 Karuveppilai kuzhambu | Curry leaves kuzhambu is a healthy kuzhambu which is good for health and hair growth as the curry leaves have more iron content. 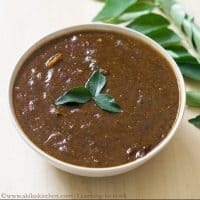 Karuveppilai Kuzhambu | curry leaves kuzhambu recipe with step by step instructions for your easy understanding and learning. 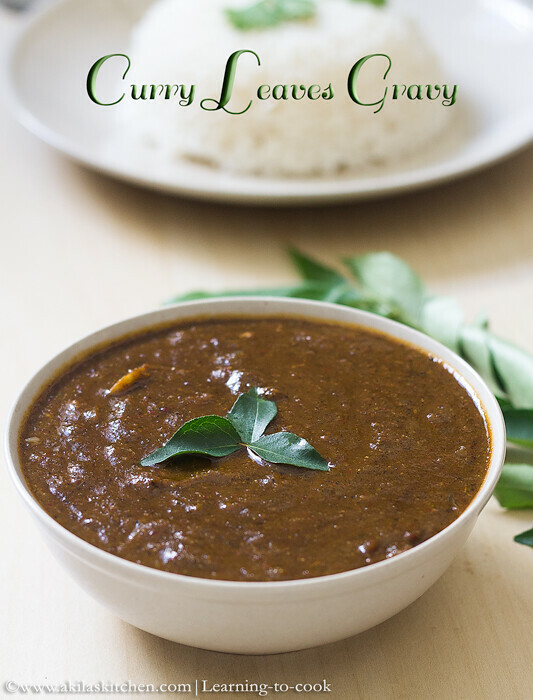 Karuveppilai kuzhambu or curry leaves gravy is a delicious and healthy kuzhambu. It has so many health benefits. My grandma says it is very good for the hair growth. 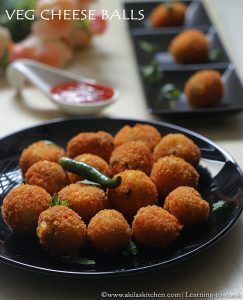 This kuzhambu can be made in bulk and stored in fridge for at least a week. Also there are so many variations for this kuzhambu and after trying out few, I sticked on to this as I loved this method and it’s so easy also. Let’s see the preparation of the karuveppillai kuzhambu. 1. Soak the tamarind with hot water for 10 min and make a paste as below. 2. Take the ingredients mentioned in list II except curry leaves and fry them till slight brown. 3. Wash the curry leaves nicely and add to the pan. 4. Transfer the fried content to the food processor and add little water and make a paste (it is better to be a coarse paste). 5. Now in the same pan, add the oil and saute the onions and garlic nicely. Add the coarse paste to this. 6. Allow to boil and add the tamarind paste now. 7. Add the coriander powder, chilli and turmeric powder and allow to boil again. 8. Let it boil for 10-12 min and the jaggery and mix well. 9. Let the jaggery gets dissolved well. 10. Serve the tasty and yummy kuveppillai kuzhambu with plain rice. 1. Always use fresh curry leaves for this kuzhambu. 2. There should not be any raw curry leaves smell, so boil the kuzhambu nicely by adding enough water. 3. If you have sambar powder, use it instead of coriander powder and chilli powder. 4. This kuzhambu can be kept for 4 to 5 days in fridge. Soak the tamarind with hot water for 10 min and make a paste as below. Take the ingredients mentioned in list II except curry leaves and fry them till slight brown. Wash the curry leaves nicely and add to the pan. Transfer the fried content to the food processor and add little water and make a paste (it is better to be a coarse paste). Now in the same pan, add the oil and saute the onions and garlic nicely. Add the coarse paste to this. Allow to boil and add the tamarind paste now. Add the coriander powder, chilli and turmeric powder and allow to boil again. Let it boil for 10-12 min and the jaggery and mix well. Let the jaggery gets dissolved well. 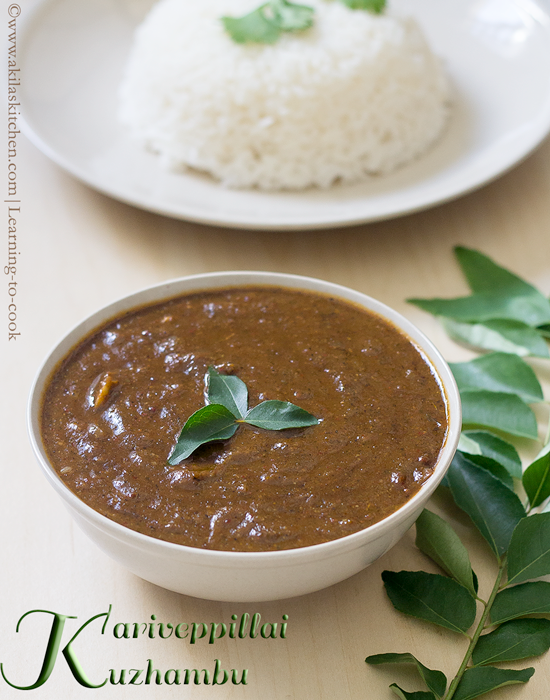 Serve the tasty and yummy kuveppillai kuzhambu with plain rice. Always use fresh curry leaves for this kuzhambu. There should not be any raw curry leaves smell, so boil the kuzhambu nicely by adding enough water. If you have sambar powder, use it instead of coriander powder and chilli powder. This kuzhambu can be kept for 4 to 5 days in fridge. *Post first published on Jan 23 2015. post updated with recipe. A nice rich look recipe. This will be a good recipe for lunch. Gosh! mouthwatering. I simply anything cooked with curry leaves. I have a small plant in my garden and happily I pluck the leaves to add into the dishes I make. It looks so flavourful and tasty! I can have it with a hot rice and pappad, looks delicious!